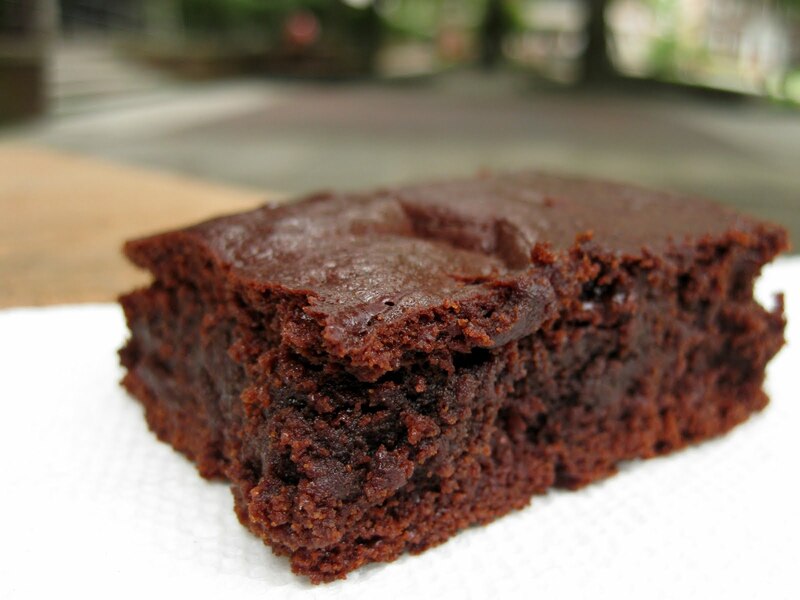 BakerGal Chewy Paleo Brownie Recipe: The BEST Paleo Brownie Recipe! A close up of the delicious paleo brownie recipe. After testing and reporting back on a slew of paleo brownie recipes, it was time to take what I'd learned and try to design my own, hopefully better, paleo brownie recipe. Hint: I succeeded. Determined to get as close as possible to traditional chewy brownie taste and texture (and to avoid complicated recipes and exotic ingredients), I decided to ditch the fruit and coconut brownie recipes and use the first, almond butter-based recipe, as a starting point. I turned to one of my favorite publications - Cook's Illustrated - to glean tips about making the perfect brownie. They had discovered the secret to a make-at-home brownie with the satisfying chew of box brownie mix (use the right ratio of saturated to unsaturated fat) and also knew how to get that shiny/crackly brownie top (use white sugar, not brown sugar). Even armed with this new info, though, I was still at a loss: With no added fat in this recipe, I had no ingredients I could tweak to get anywhere near the perfect ratio. And, with white sugar on the not-paleo list, I had no chance of scoring a crackly brownie top. Instead of honey, I used light agave syrup, which has a light caramel-like flavor (and added more of it). I added more cocoa and "bloomed" it by heating it in the agave syrup to intensify its flavor. I removed the eggs: With so much moisture coming from the agave syrup and almond butter, eggs made the brownies too moist for my taste. Below, I explain how to add an egg to the recipe if you'd like. It's hard to imagine an entire family on the paleo diet, so I also downsized the recipe from a 9x13 pan to an 8x8 pan. A more-baked layer forms on the brownie top and edges that provides chewiness and protects the paleo brownie's inside from drying out. Note: I preferred the egg-free version the day I made it, but I thought it was a little dry the next day, so I am considering one more eggless variation where I use 1 cup of almond butter and 1/4 c applesauce, assuming the applesauce might help bring more lasting moisture to the mix. Taste-testers preferred the version with the egg, saying that it still tasted moist without getting too dry or chewy, and felt that it was more like box brownies than the eggless version. 1. Heat agave syrup gently over stove until warm (do not allow to boil). Stir in cocoa powder over low heat until smooth. Cocoa burns easily, so keep the heat on very very low. 2. Remove from heat and stir in remaining ingredients except salt until thoroughly mixed. 3. Sprinkle batter with salt, and fold batter to mix it in. 5. Bake paleo brownies at 325F for 40-50 min. Insert a toothpick in the center of the pan to determine done-ness. (I baked mine in a glass pan at 325F for 45 minutes, and it seemed perfect). Let cool completely before cutting. Store in a plastic ziplock bag to preserve moisture. Reduce almond butter to 1 cup. Mix egg with vanilla extract, chocolate extract, espresso powder, and baking powder before combining with agave-cocoa-almond butter mixture. I hope you enjoy these paleo chocolate brownies! Hello. this dish appears yummy and delicious and i have never tasted it before.but it looks so luring that i cannot stop myself to ask my mum to prepare it for me this browni . Why foil line the pan? Do you need to if you use a glass pan? Looking forward to trying this recipe. Why do you need to line the pan with foil? Do you need to do it if you use a glass pan? This looks good - anxious to try it. Great question...the reason for the foil is that you can't butter or grease the pan (the paleo standards don't allow you to use refined oils or butter). Foil helps you easily remove the brownies from the pan...when they are done, you can just lift the brownies out by using the edges of the foil like handles. You will still want to use foil regardless of the type of pan - unless you grease the pan, the brownies will stick, even if you use glass. However, if you use a glass pan, you will also want to lift the brownies out of the pan right away to let them cool on the counter and not in the pan in order to avoid over-cooked brownies. This is because of the superior thermal property of glass - it retains heat very well, so it will continue to cook your brownies even after you've removed them from the oven! Thanks for the prompt response. I thought you could use olive oil (probably not an attractive option for brownies)or coconut oil (maybe a better option? )on the Paleo diet to grease a pan. There are no really hard and fast rules to being Paleo...Robb Wolff even makes concessions for moderate intake of grass fed dairy, and coconut oil is widely advocated for the healthful benefits of lauric acid. The central tenets are to avoid grains, legumes, and non-pastured dairy. Coconut oil should be fine to oil the pan...in fact, since aluminum leaching into your food through direct contact with foil during the cooking process is probably more of a concern than a little natural oil, I would just grease the pan. Anonymous - You're welcome for the prompt response! Dia Wong - Thanks for the wonderful info! Dia: I've updated the instructions above to note the option for greasing the pan! Mmmmm! I bet the espresso powder makes these incredible! They do look super moist and now I'm craving gooey brownie. :) Making these asap! Thanks Melanie! :) Glad you liked them! These brownies were our first attempt at a Paleo dessert and we are so glad that we tried them! They turned out amazing! They taste just like regular brownies with a slight twist on the sweetness due to the agave. We will definitely be making these again (and again)! Instead of the aluminum foil, you might try lining the pan with baking parchment. I found that having baking parchment around is one of the best hacks I've incorporated for paleo cooking... and baked goods don't stick in the corners with baking parchment like they do on foil. Thanks, Anonymous - I've updated this and the related paleo brownie post to reflect your input regarding the parchment paper! Have you tried raw honey or pure maple syrup instead of agave syrup? Hi Anonymous! I haven't tried maple syrup, but I have tried a batch with conventional (not raw) honey. It turned out just as good, but with a distinct honey flavor. If you try a batch with maple syrup, please let me know how it turns out! I can't wait to try these, I'm going shopping tomorrow! Would it be possible to substitute almond flour for the almond butter? I can't get almond butter in Europe for a reasonable price (if at all), but almond flour is easy enough to make with a blender. Hi bildungsr0man! I have not tried this method of using almond flour in place of almond butter yet, sorry to say, but I encourage you to test it and report back! My guess is that you will not be able to extract enough of the oil from the almonds just by blending them, yielding a much drier brownie. So, I would suggest adding some extra liquid or oil of your choice, perhaps about 1/4 to 1/3 cup (apple sauce, a few eggs, olive oil, honey or agave syrup, or maple syrup). Good luck! Paleo isn't just a list of "do eat" and "don't eat" - it's a nutrition philosophy. You're thinking like a gluten-free dieter - "let's just find another way to eat the same thing". Paleo isn't like that. That concentration of sugars and fats would not be found in the cavemen diet. 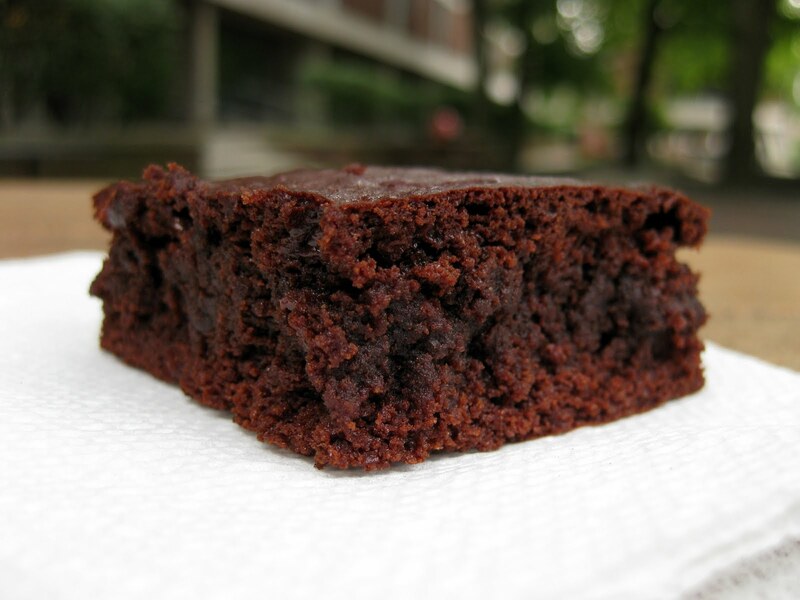 Cavemen did not eat brownies, so you can't really have a Paleo Brownie. Thanks for your comment! Yes, it's true that food wouldn't have been eaten in this way in paleolithic times. That said, people *are* looking for a better way to make the foods they already love and eat them in moderation. And since I have lots of baking experience, I'm happy to help them get closer to that goal! If people are looking for another way to get even closer to that goal, (for example, by reducing the amount of sugar) I'm happy to make an even more paleo version of the recipe (for example, omitting agave syrup in favor of a natural sweetener substitute, like chopped dates, or stevia). Thanks for your comment - I think it is important for readers to keep in mind the more strict philosophy that underlies the paleo lifestyle. With all the calories in agave (and on top of that, I'm allergic to it) I'd like to know how to cut down on the "sweet". A substitute you could use here instead of agave is honey. The recipe works with refined honey. I have not tried it with raw honey, which you might prefer because it has a lower glycemic index, and would suggest you try that. To cut down on the "sweet" you could reduce the overall amount of honey (for example, try using 1 cup or 3/4 cup) and substitute it with a small amount of water or apple sauce to maintain moisture. Since water and applesauce are more wet than honey, I think you would want to use less than the amount of honey you removed from the recipe. The flavor will be different (and you may need to bake it longer), but it might work! Please let me know if you try it. Thanks! Very good recipe. I've made this twice with raw local honey, and homemade raw almond butter (in the Vitamix). Can you substitute the baking powder? Though I used a non-gmo, aluminum-free version (Rumford brand). Hi, Awesomely Humble! Thanks for letting me know how the raw honey went! I made a note in the ingredients list to give other readers a heads up that raw honey will work. As far as I know, there isn't a good substitute for the baking powder...and if you leave it out, the brownies won't rise. These are yummy! I'm making a second batch right now! I made a batch for a Birthday celebration and they were awesome! I used raw honey, raw fresh ground peanut butter, and the egg option.. The batter was pretty think but i managed to get it in the pan. Smells amazing! Hopefully this 40 minutes will pass quickly. Can't wait to try them! I just made these as my first paleo "treat"- yum!!! I used the egg option. They took a little over 50 mins to cool, but they are so good! Glad these worked out for you! I have these baking in the oven right now and i cant wait for them to be done!! What can I substitute? This will be my first Paleo recipe. I couldn't find the raw syrup. Could I substitute low-glycemic all natural syrup? or is that about the same? I also couldn't find almond butter. Could I substitute a buttery spread with EVOO? Exactly what can I not have in this diet? I'm so new to it. Thanks! You'll have to use almond butter for the recipe to work. You can substitute raw honey for the agave syrup. To learn more about paleo eating, you'll have to search online for authorities on the subject! Best of luck! Getting ready to make these tonight and am excited! Going to try to make some coconut milk whipped cream to go on top! Just made these with raw agava and er...umm...Fry's cocoa (it's all I had and unsweetened, but not organic) I added some pecans to the top of the pan and if the actual brownie tastes 1/2 as good as the batter did I am in trouble!!! I will have to find a group of people to share them with. It took a bit more time heating the agava and cocoa powder BUT that being said the NEW Chocolate agava syrup I learend how to make in the first 1/2 of the recipie will make a wonderful treat on paleo pancakes! Thanks for your hard work developing this recipie!! I have these in the oven right now I am a little nervous hope they turn out good! These turned out amazing! I used honey and the egg option and I didn't have almond butter so I used peanut butter- I know the pb option makes it a little less Paleo, but it still turned out fantastic and I can't stop munching on them! I just made these and I was BEYOND excited about them because the batter was just...oh my god, no words. But I overcooked them by AN HOUR. But even through the burnt flavor, I could tell that had they not been burned, these would have been more than delicious. I can't wait to try them again! I wrote a blog post about them here (http://thebaboo.com/?p=337) and I linked to your recipe. Thanks for sharing! Oh, so sorry you overcooked them! Good thing you got to enjoy the batter!! Good luck with the second batch! I used smooth commercially ground almond butter when I made this. However, I think it might still work with Whole Foods-style almond butter. My hunch is that you may need to add a tablespoon or two of water to the almond butter as you are heating it up, to give it some of the fluidity that a commercially ground nut butter has. Finally, watch more closely while it is in the oven to check for doneness. If you try it, please let me know how it turns out! Just made these brownies (2/29/12). OMG -- thanks a ton! It is shocking how fantastic they taste -- you know, just like real, honest to goodness brownies! Thanks again! you can sub flax seed meal mixed with water for eggs. i use 1 tbs flax meal and 2-3 tbs water per substituted egg. i mix the flax meal and water and let it gel while i prep the rest of the ingredients. cheers. You're like the Alton Brown of Paleo brownies! Awesome! :) Thanks for the appreciation! These look delicious. Nice Recipe. Thank you BakerGal! I am not following the Paleo diet, but have looked at different recipes because I have several food sensitivities to include gluten, corn, soy, dairy, eggs, rice and some fruits. This recipe was great. It is the first dessert I have found that actually has a good desserty flavor and texture. Thanks for your hard work to perfect this. Just made these and they are not good. Something is very wrong. The texture is OK but they are sour and unpleasant. I think the culprit is the raw honey plus the almond butter which was "all natural" but not raw. I grabbed it at Whole Foods and didn't stop to think about the difference, and your recipe didn't specify raw. This almond butter had sugar, salt, and palm oil. Could that be what ruined it? I'm bummed I wasted the time and money. I am sorry they did not turn out for you. You are right; Something must have been wrong, because the finished product tastes very similar to a traditional brownie, and there shouldn't be any sour flavor. Whether the almond butter is raw or not does not make a difference, but that is a logical guess to make. There is a possibility that the almond butter had gone bad, as nuts and nut butters can go rancid. Another, maybe more likely, possibility could be the honey...raw honey brands can vary in terms of sugar content because the amount of wax/honeycomb included varies; perhaps you used a honey with a high wax/comb content, resulting in the bitterness of the cocoa coming through too strongly. One way to test this would be to try the recipe again with agave syrup. I understand how upsetting a recipe flop can be, and appreciate that you reached out to see whether I might have a solution. I'm sorry to be unable to pinpoint what went wrong for you and wish I could. I hope these thoughts help in some way! These are delicious! I did 1cup maple syrup and added the egg. Perfect! Thanks for sharing! I gave you credit at the bottom with a link. yay! you nailed it, again! i did the eggless version, with 1/4 c. raw local honey, 1/4. c. maple syrup, and 1/2 c. apple sauce. they turned out fabulous! you could def taste the honey and a slight fruitiness from the apple sauce, but i didn't mind. chewy and super chocolatey. Great version. I modified by dropping the agave and substituted 3 over-ripe bananas, added coconut water to right consistency and thought it was also quite good. Made these without the chocolate extract or espresso powder, and with an egg... loved them! Still even a little drier than I would prefer, but for a paleo brownie they taste awesome. Haters to the left! I just made these using half honey and half agave (just because we ran out of agave) and cashew butter instead of almond. They turned out so great and are way more delicious than I could have ever expected. Thanks so much for coming up with this!! Can you substitute cashew butter for almond? I haven't tried it myself, but it might work. If you give it a try, please report back! Sorry, I'm not aware of an almond butter sub for this recipe. I can't wait to make these and your chocolate chip recipe! I'm getting ready to head out to our organic store shortly and have a question about the aguve syrups for both. I've seen a darker syrup and a lighter colored. Is it the same as with the lighter and darker, say, Kyro syrups? Or is one refined and one raw? I'm still learning about substitutions and using other sweetners. I usually skip the sweets when doing paleo and have just started looking for sweet staples other than cheating with cookies from the gluten free aisle! Thanks for all your hard work and research! Hi Anonymous - As far as I know, the only difference between how lighter and darker agave syrup is produced is how filtered it is. The unfiltered/less filtered darker syrup has a stronger caramel flavor and more of the original minerals. In the lighter syrup, some of those trace minerals have been filtered out along with other material, leaving a lighter colored syrup with a less noticeable caramel taste. Can you share a recipe that has - dare I say- Splenda or maybe truvia packets? I am diabetic and honey and agave make my blood sugar rise and require injections as do flour. Looking for recipes with coconut and almond flour like this. Not sure how the texture and taste would be with Splenda in this recipe. Thanks for your comment! I've tried a few tests with sugar alternatives like splenda and truvia. I didn't care for flavor of the resulting baked goods, so have decided not to experiment any more with them. My apologies! However, I don't want to discourage you from branching out on your own, and learning how best to substitute these sugar alternatives in existing recipes. Good luck! Is it possible to use a dark cocoa instead of the chocolate extract and espresso? I didn't even know they made a chocolate extract (sounds like it would be very useful). Yes, do feel free to make the recipe without the extract and espresso powder. It should still come out tasting like a chocolate brownie! The add-ins make it a little extra special and make up for some of the other depth you lose by changing the recipe so much from a traditional one. I hesitate to suggest using a dark cocoa powder, though, on the concern that it may introduce a lot of bitterness into the brownies. Proceed there at your own risk, but also with the possibility of reward if it works! Thanks for your message. :) I think you could try maple syrup, and it might work out okay! I'll warn you that I haven't tried it myself, but maple syrup's similar sweetness and consistency makes me think it is likely to work out. I wouldn't try molasses...that would most likely not work! These are delicious! Even my picky 3 yr old is begging for more! Sorry, I don't have that information for these desserts! These were pretty good. Really sweet! I did add the egg, but forgot to reduce the almond butter. Also, I added chocolate chips, but they melted when I folded in the salt. Whoops. They were still good! Made the version of these with egg tonight, and they turned out quite good. I'd still like to try out the 5th recipe from your trials, but I love having a non-coconut version. These look and sound amazing. Would you please list the amounts to make the 9x13 version? Our entire family is eating Paleo. Sure! To make a 9x13 version, simply double the ingredients. The brownies will be slightly taller than in a 8x8 pan (because the footprint of the 9x13 pan is only ~1.8x greater, not 2x greater), and you will need to bake it longer, maybe 10 minutes or more, because the center of the brownies will be farther from the edges than in an 8x8 pan. Watch closely, and check using a toothpick inserted in the center for doneness. Loved these brownies! Thanks for the recipe. I've been using maple syrup in mine and they are delicious! Sounds soo good! Any chance you have a similar (egg free & paleo) Blondie recipe? Will this recipe above work if I leave out the cocoa? Or do I need to add something dry? Hmmm! The above is egg-free already, but I have a hunch that if you take out the cocoa powder, it won't turn out. I don't want to discourage you, though, from trying to substitute it with something you like! Maybe try flaked coconut? Or more almond butter? If you try it, please let me know! I'm sorry these did not turn out for you! I wish I could be there to help troubleshoot on site and figure out where it went wrong. I haven't personally tested it with peanut butter, and I think that might be part of the problem -- a slightly different grain size and ratio of oil, moisture, and protein in almond butter could make it hard to substitute. Another possibility could be that the oven temperature calibration may have been off, causing it to overcook (ovens can sometimes run 50 degrees off from what the oven readout shows...the best way to check is with an oven thermometer). Or perhaps it was something else. In any case, I'm sorry again that they didn't work! If you're curious to try out some other paleo brownie recipes, I have another post where I compare and review about 5 different recipes against each other, and many are not nut-butter based. I made a few adjustments including substituting the agave for raw honey, I added chopped 70% cocoa dark chocolate, and followed the instructions to add one egg. I suspect it was the added chocolate but I found these cloyingly sweet! Next time I will reduce the honey and keep the chocolate. Also, I found these even better the next day. I do have to agree with many of you that these are the closest I've had to "real" brownies. Thanks so much for all your efforts to find the perfect paleo brownie recipe and for sharing it here. I've never actually commented on a blog, although I always read everyone else's comments, I figured now would be a good time to start :) This was my first shot at something sweet for paleo and they turned out great! I didn't have the espresso or chocolate extract but they tasted great anyway. Only thing I did do different was use a double boiler because I was nervous about burning the cocoa powder. Great recipe, and better yet, great explanation for the recipe! New to Paleo, and almond butter. Do you need to warm it before using since it's stored in the refrigerator? If so, how is this done? Also, why do the chocolate chips melt when adding the salt? (Saw it in previous post). How can this be avoided? Tried another recipe and it was terrible. Used concentrated coconut, but did not melt it. Could that have caused the small chunks of it in the finished product? Thanks! Almond butter first needs to be stirred, whether room temperature or chilled, because the nut particles separate naturally from the nut oils. Once you've opened a container, you should refrigerate it to store it. If chilling the nut butter makes it too stiff to incorporate into other ingredients, you can heat it for just a few seconds in the microwave or on the stove top until it is room temperature again. I'm not sure what you mean by chocolate chips melting when adding salt. Salt should not cause chocolate chips to melt. I read the previous post, and did not see any reference to this. If you provide a link and direct quote, I might be able to help you. I'm also not sure what you mean by concentrated coconut. I'm guessing you mean coconut oil? This is a fat extracted from coconuts that is solid at room temperature, as described above. You do need to melt it (in a microwave or at room temperature) before using it. I do think that using is solid could be what caused your troubles with the other recipe. This may sound silly...but have you any idea how much plain old white sugar I would sub for the honey? I follow Paleo, but I cook for my church on wednesdays and we make everything GF/DF but not paleo and since our budget is really limited, we go with regular old sugar. Any thoughts? Thanks for your help! I made these for a party and they turned out really good. I used peppermint extract instead of the chocolate extract. I also topped them with a coconut whipped cream using the top fat portion from a can of coconut milk mixed with honey and vanilla. They were yummy! Thank you for posting this. You're welcome! I'm so glad you liked how they turned out, and thanks so much for sharing your modifications. I love learning new tricks! So I tried 3 versions of this recipe. 1. Tried the recipe with Agave. I think it's the first time I've eatin Agave but I didn't really like the taste and think it overpowered the cocoa in the brownie but the texture was good. 2. Tried the recipe with organic honey. Not raw just bought the Organic Safeway honey. Almost tasted the same as the Agave recipe and I even used less only 1 cup. I like honey but again it seemed to overpower the chocolate. Good texture though. 3. I gave it one more shot and went to the Grade B organic Maple Syrup. I used 1 1/4 cup and warmed it up, put in the cocoa and stirred till it was warmed up and smooth and then added the almond butter and stirred till it was smooth and added it to the wet ingredients. I added closer to 1 cup of cocoa and 2 tsp of chocolate extract. The batter was a little more runny than the others but I think closer to box brownie consistency. Cooked for 40 minutes. Let them cool as the maple syrup doesn't hold as well as the honey until cooled. But let me tell you these brownies were AWESOME for not being from a box and being in the 80/20 range of Paleo/Primal. The chocolate stood out more than the maple syrup and def my favorite of the 3 by far. Next time I think I might only use 1 cup of maple syrup even. Yummy and my vote is for Maple Syrup. Thanks for trying them and for sharing your experience! I'm glad to know that the maple syrup was a big win! Excellent! I've made this twice now, and I am having trouble with the bottom burning before the center is cooked. Any helpful hints? Yes! I have a few suggestions. If the bottom is baking too quickly, and even burning, there are two things you should try: first, reduce the oven temperature by 50 degrees and bake for longer (you'll have to keep checking to determine how long), and second use the top or middle rack of your oven if you've been using the bottom rack. The problem you're experience points toward baking the brownies at too high a temperature. Because of this, I'm guessing that your oven calibration is off, so that when the dial says one temperature it is actually running at a higher temperature (hence the suggestion to try baking them at a lower temp for longer). It could also be that your heating element is at the bottom of the oven and possible that on top of that there is poor air circulation in your oven causing uneven temperatures throughout. Making sure the pan is not close to the heating element may help with this. Hopefully some combination of the above suggestions will help you troubleshoot the problem! I would love to see the recipes with stevia as I stay away from sugars as much as possible. Thanks for the feedback! I will keep this in mind and explore more with stevia when I try future sweet recipes. I'd love to hear about any awesome tips you may have for using stevia, as I haven't tried it much yet! Made these this evening with the intention of taking them to a family dinner tomorrow! I used 1 cup raw honey and the egg version. They were a little drier than I would have liked and maybe had a smidge too much salt, but I liked them! However, when I handed one to my non-paleo husband, he took a bite, shook his head, and begged for a glass of milk. He said if I like these brownies then it's been way too long since I've had a real one! Which is true... But hey. Great Paleo option for those of us with a sweet tooth! Unfortunately I'm probably going to have to throw these away, otherwise I will eat them all tonight since I have no one to share with! Sorry they turned out a bit dry! That wasn't my experience, but I know things can be different from brand to brand and oven to oven! I'm glad you liked them, even if your hubby wasn't a fan. :) You can always cut them up and stick them in the freezer for future eating if you're worried about eating them all at once! Trying a modified primal diet for 30 days and came across this recipe. I have a HUGE sweet tooth and am very picky about brownies. I had to adapt this recipe slightly based on what I had on hand. I subbed peanut butter for almond butter because that's what I had. Used an egg and reduced the sweetener to 1 cup because I added 1/2 cup 73% dark chocolate chips. I only had Hershey's Special Dark cocoa so that's what I used. Also, split the sweetener 1/2 honey and 1/2 maple syrup to reduce the powerful honey taste. Baked as directed for 40 minutes. They were fantastic! I couldn't believe these didn't have flour in them! The texture was very fudgy which is what I prefer in a dark brownie. The honey was only slightly noticeable as was the peanut butter. Next time I'll splurge and buy almond butter to see if the nutty taste is less pronounced so that the chocolate can come through better. Probably won't add the chocolate chips next time. Reducing the sweetness was perfect but I like very dark chocolate so my changes may not work for someone who misses milk chocolate. I usually can eat 3 or 4 brownies but I barely made it through one of these. That's a good chocolate fix right there! Great recipe to ease into a grain-free/gluten-free diet or to bring to a party for everyone to enjoy. Comments or questions? Let me know what you think!